Popular wisdom says that fat is unhealthy. It is a plain and simple fact: the more fat you have on your body, the more likely you are to become ill, and to die sooner. This is something everyone in Western culture accepts as true from a very young age. Nevertheless, just as the fat and cholesterol recommendations from the last few decades are beginning to crumble, so the dogma around body fatness and health are beginning to crumble, too. As it turns out, there is no clear correlation between being “overweight,” which means having a Body Mass Index (BMI) between 25 and 30, and poor health. In fact, out of all of the people who develop heart disease, those who are overweight have a much lower risk of death than those who are “normal” weight. Moreover, so far as nearly every systematic study conducted recently on mortality has shown, people with a BMI between 25 and 30 live longer than people in any other weight category. The waters of body weight are much murkier than we (and certainly I) ever expected. So I decided to dig deep and find out what we do know. What do we know about fat and health, to the best of our knowledge, today? We often conflate the perfect body with perfect health, but that is a flawed concept. The truth is that a fit body provides merely the assumption that an individual has good physical health. What is her fasting insulin? Her C-reactive protein? Her triglycerides? These three markers are perhaps the most important indicators of health, with a wide variety of metabolic indicators, hormones, and micronutrient levels all playing important roles. These are the first things we should think of when we want to evaluate physical health—not appearance. There are plenty of people in the world who appear perfectly fit on the outside but who are dangerously unhealthy once you take a closer look. Now, these poor health markers are more likely in the significantly obese, but any sort of line between ‘thin’ and ‘obese’ that would demarcate which is at greater risk of disease is impossible to map. There are simply far too many variables at play for body fatness to be the only significant factor in health. People well into the “obese” category often test perfectly well. Crucial influences on overall health include nutritional status, gut health, personal history, eating patterns, fitness level, sun exposure, alcohol consumption, sleep status, and stress. Just because someone’s body manages to store and burn fat faster than someone else’s does not mean they are healthier. Just because your body might not burn through fat as efficiently as someone else’s doesn’t mean they are more healthy than you. Of course, you need to be sure that there isn’t an underlying problem causing body fat storage like inflammation, leaky gut, or insulin resistance. That is entirely possible. But it is by no means necessary. If there isn’t an underlying health condition assocciated with fat storage, it may be a simple matter of genetics, the quality of nutrition anda body type you had as a child growing up, or of having a history of dieting (which so many of us do), which leads to slower fat burning mechanisms in the long run. 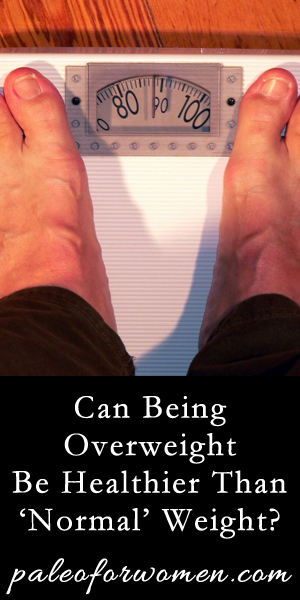 As it turns out, not only is it possible to be healthy while overweight, it also appears as though overcoming some specific health conditions is greatly helped by being overweight. As more and more research is done in this area, the list of conditions grows. To be sure, there is a correlation between obesity and certain diseases, particularly when the body fat is located in the abdomen. Belly fat can release fatty acids and inflammatory compounds into the body which can increase “bad” cholesterol levels, triglycerides, and blood pressure. This kind of body fatness is significantly correlated with incidences of heart disease. Type 2 diabetes is another major category of disease associated with body fatness. It is estimated that 1 in 3 people born in the Western world after 2ooo will have type 2 diabetes. There is a clear increase in risk of type 2 diabetes with increasing body fatness. However, we need to be careful because we do not know if body fatness is what causes the heart disease diabetes in itself, or if both of these conditions arise as a result of a different underlying factor, such as inflammation. We tend to think that just because things occur at the same time that one of them causes the other. This is a common error found all over academia and the medical sciences. But it very well may be the case that these conditions are simple correlated, and that the body fatness is not specifically the problem that is causing the health condition. Moreover, we need to be careful because obesity researchers are notorious for their “clumping” biases. Pretty much of all of the data on body fatness groups people into four distinct categories (distinguished by BMI, which I discuss below): the underweight, “normal ” weight, overweight, and obese. There are pretty narrow margins between underweight, normal weight and overweight, but the “obese” category covers anyone above a BMI of 30. That is an extreme range and the nuances to be found within that range need to be attended to. Extreme obesity, like extreme thinness, is certainly a health concern, and may skew data for the rest of the people who are less obese but still fall within the obese category. On one point the data is quite clear: generally speaking, the people who live the longest are those who are “overweight.” The underweight and significantly obese fare the worst in this regard, then followed by “normal weight” people, and finally the “overweight,” who fare the best. In 2005, the scientific community heaped scorn on a paper published in the prestigious Journal of the American Medical Association (JAMA) by now famed epidemiologist Katherine Flegal. This was a seminal paper. It was a well-done statistical analysis… and it has really given the entire medical community a lot to think about. Flegal’s study involved an analysis of data from the National Health and Nutrition Examination Survey (NHANES), a long-term study into the health and diet of 33,000 Americans. Ranging from two-month-old babies to people aged 75, the subjects are chosen to give a representative snapshot of health and diet across the USA. Flegal found, as I mentioned, that the severely obese (BMI over 35) and underweight (BMI under 19) were the most at risk. But remarkably, those classified as mildly obese were at no greater risk of dying prematurely than their normal-weight counterparts. And, more extraordinary still, those who were overweight were actually at a slightly reduced risk of dying compared to those in the normal weight range. After conducting this study, Flegal realized that it wouldn’t be enough to sway anyone, so she extended the study to review 97 similar studies. Her new data comprised 2.9 million people and yielded the same results: the overweight live the longest of everybody. 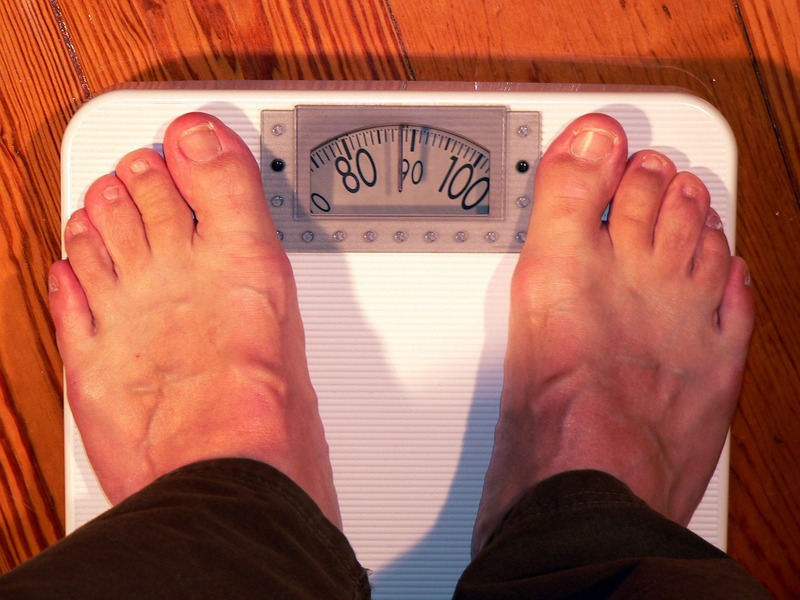 Is all of this explainable because BMI is a poor measure of body fatness? The most common reaction you might find to this “fat paradox” in the health blogger community is a denunciation of the BMI as a metric of body fatness or health at all. BMI is calculated by dividing weight by height. This is a decently fair measure to approximate the size of a human being, but it actually says nothing about body composition. You may be particularly big boned, for example. Or, more commonly, you may be very lean but significantly muscled. This means you will be heavier but still have very little body fat. This is a really big problem for people who are fitness professionals and have to battle with insurance companies. Insurance companies want to stick them with higher premiums because they are “overweight,” when in reality they are so heavy because they have so much muscle. Fitness gurus don’t like this one bit, and for good reason. So yes, muscle mass does play a significant role in the inadequacy of the BMI. However: most people in the world are not fitness junkies, there are many more people in the world with high BMIs due to body fatness. And more importantly, there are many other nuances that need to be taken into account. For example: first, we need to recognize that there are different kinds of fat. Abdominal fat, like I pointed out earlier, can be pro-inflammatory and cause significant problems in terms of cholesterol levels, triglyceride levels, and inflammation and cardiovascular health. Fat that sits on the hips and thighs, on the other hand, can be healthy in a number of ways. It helps protects a woman from malnutrition during pregnancy, for one. Fat in the lower body can also trap potentially harmful fatty acids from travelling through the bloodstream and to the heart. Visceral fat (so all fat in the lower body and otherwise stored under the skin, just not in the abdomen) can provide a crucial boost when the immune system needs energy to do hard work. This is in large part why burns, pneumonia, and cancer are often helped by additional body fat. A kind of fat called omentum fat can perform a complementary function: instead of ramping up the immune response, it can calm down the body’s biological defense mechanism, and prevent the immune system from overcompensating or causing collateral damage. This is extremely important since an overactive immune response is often the true cause of death in response to illnesses. So then, so far as we can best tell, muscle mass may be a confounding factor for the Body Mass Index, but there really does appear to be a slew of biologically important mechanisms at play here. And the research that is currently being conducted is relatively nascent. More studies obviously need to be conducted on the relationship between body fatness – not BMI – and disease, and specifically different kinds of body fatness. Is this a “paradox” that just needs to be resolved in another fashion? One of the most popular explanations is that overweight people get more aggressive treatment than thin people, because their weight raises red flags at the doctor’s office. This doesn’t seem all that reliable: so far as we can tell, overweight and obese people tend to avoid doctors, get fewer preventive screenings, and receive worse treatment because they’re often misdiagnosed as “fat” rather than with a specific medical condition. The paradox may also be because of smokers, some have hypothesized. Smoking makes people thinner and sicker. Yet Flegel removed smokers from her studies and found no difference in her results. Taking a step back from body fatness, we can see that there are a whole slew of factors that contribute to overall health, many of them which are most likely far more important than actual body size. Diet, for one, is incredibly important. The nutrients you get into your body and the toxins you keep out are at the top of the list of important factors in health. I don’t think I need to state this twice. Fitness, for another, is incredibly important. Paul McAuley, a health education researcher at Winston-Salem State University in North Carolina, has been studying fitness for close to 20 years. He says most studies on weight and health fail to take it into account. “Or they ask one question about it,” he says, and don’t bother to go further. When McAuley collects data on fitness, he finds that it predicts health and longevity much more strongly than fatness. Stress, for a third, is also incredibly important. Many studies show that stress, like fitness level, is more important than body fat percentage in promoting health and longevity. For example, some studies show that implementing Healthy At Every Size practices, which means ignoring weight regulation in favor of intuitive eating and living, significantly decreases mortality in overweight adults, and promotes better lab results, health behaviors, and self-esteem than weight loss treatment. Stress up-regulates adrenal function—and chronically elevated cortisol levels cause a vast array of health problems, including reduced sleep quality, impaired immune function, and a higher risk for metabolic derangement and virtually all diseases of civilization. Finally, neuroticism, defined by emotional sensitivity and negative emotions which include low self-esteem, is one of the greatest health risks and predictors of mortality of all. Primate studies also show that animals lower on the hierarchy are more susceptible to diseases and a shorter life, simply because they are in a less secure station in life. Being unhappy, in the end, may be the single most important risk factor for a short, unhealthy life. Plenty of studies now other than Flegel’s have been released that demonstrate that people who are “overweight” live longer than anyone in any of the BMI categories, including “normal weight.” Researchers often find these results in their studies but rarely advertise them as such, for fear of being shunned as a heretic. You can read about a selection of them here. It is quite clear to me that at the very least we need to take a step back and disassociate health from body fatness. I know plenty of people who eat super well and are incredibly healthy but just so happen to have more body fat than others. This may be because of the environment in which they grew up, the types of diets they were on throughout their lives, or the genes they were born with. When we look at a person, we never know what they have been through. We don’t know if certain health conditions have caused their body fatness or if they are incredibly fit but still overweight. By all appearances that is fine. The true test of health is a blood test. Or perhaps it is a stress test. Or a psychological questionnaire. Honestly I don’t know. The concept of health is complicated, and I really only think it can be measured in our last days, when we can look back on our lives and reflect on how fit and happy and capable we were throughout. What do you think the greatest indicator of health is? What’s wrong with how we do it today? What can we do better? I would love nothing more thant ohear your thoughts!! I think the element that isn’t considered here is affluence. A person who is slightly overweight might be that way because they have access to all the food they want to eat, but yet still maybe exercising some moderation- a characteristic that might lead to better health outcomes. This profile of person also has access to better healthcare, and will enjoy lower overall healthcare costs than their very obese counterpart. I think biases like these can skew data, if not considered. Agree Tim that there might be various biases that make the outcomes very murky, and Stefanie doesn’t explain here all the details, but it is possible that the authors do control for various variables like smoking for example that Stefanie does mention – so need to go and look at the papers in more detail. Thank you Stefanie for yet another fascinating post, do keep them coming! This is such an important subject and I especially love how you finish this article off. The idea that everyone can so easily be classified as either “healthy” or “unhealthy” just like that has always baffled me. That isn’t how health works, right? It’s a system of constantly fluctuating forces, our physiology always in a state of change. We are dynamic bodies, all of us carrying (even if dormant) some kind of bacteria or viral disease that under the right conditions could kill us or make us very al, all of us harboring the scars old injuries, all of us eventually heading to the grave. It seems obvious to me that the obsession that so many “normal” or “underweight” individuals have with insisting that all fatness is unhealthy has nothing to do with actual health and everything to do with demanding that fat people, especially fat women, conform to modern standards of beauty. The amount of utter fury that has been directed at me by misogynists because not only do I dare to be fat, but I do so apologetically a with great joy. I have more important aspects of my life and my health to worry about than some random arbitrary number on a scale, or what some asshat on the internet thinks I should look like so he can enjoy objectifying me more. I’ve heard it argued that the reason for lower death rates amongst the overweight, it’s because a lot of people might get sick while overweight, lose a lot of weight due to the illness, and when they die they will be classified as normal weight. Do you have any thoughts on this? Love your post, and I agree wholeheartedly that weight (and especially BMW), isn’t the best indicators of health. I’m actually not sure, love, as I’m not actively a part of this research and community. I’ll do some poking 🙂 My bet is that researchers account for this in their studies – at least the good studies – but I’m not sure so I’ll look into it.